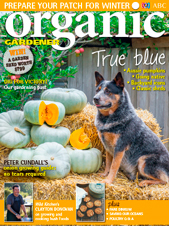 This issue we celebrate all things Australian in the garden, from the humble shed, to indigenous foods, Aussie bred livestock, fruit, flower and veg varieties, and good old-fashioned Aussie ingenuity. Plus, to mark the centenary of Anzac we’re digging for victory and revisiting our gardening past. And… how safe is your soil? Cook up some Aussie favourites with a twist, and an ocean SOS – is it too late to save our seas? Justin Russell reckons there are few vegies as true blue as the pumpkin and names his top five Aussie varieties, plus tips on how to grow and store them. Crying out for advice on how to grow a successful onion crop? Peter Cundall’s expert tips are sure to bring tears of joy! Chef Clayton Donovan is using the wild and robust flavours of the Australian bush to help shape a unique cuisine we can call our own, writes Kylie McGregor. Plus his top bush foods with cooking and growing tips. Stuart Read revisits our gardening past and the wartime campaign for people to ‘dig for victory’ by growing their own vegies, boosting a nationwide backyard food movement. Winter is on the way so it’s time to relish in reduced pest and disease problems and prepare for cooler conditions. Australia is certainly no slouch in the ingenuity department. Jacqueline Forster picks her top 10 homegrown inventions in agriculture and sustainability. Renowned Australian photographer Simon Griffiths celebrates sheds of all shapes and sizes in his latest book, Shed. The world’s oceans are fundamental to human survival – they are also in peril. It’s time to turn the tide and preserve this vital resource, writes Dr Reese Halter. Phil Dudman and Julie Ray look back at the dramatic changes in the garden and kitchen over the years, plus new recipes for traditional Aussie fare. Organic market - Clean and green products for your home and body. Organic plant - Nutrient-dense plants for the cool season. Losing the plot: Simon Webster admits that while he might be a dedicated seed saver, he never quite gets around to sowing them. Competitions - WIN a garden shed worth $799 or a copy of Simon Griffiths’ book Shed. with commentray by our own Aussie icon, Peter Cundall.